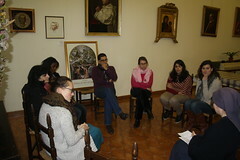 On December 1st, to begin advent well, we held a retreat for adults and youth in Rome. 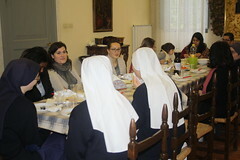 The day began with Mass at 10 a.m. in the Sisters' house. 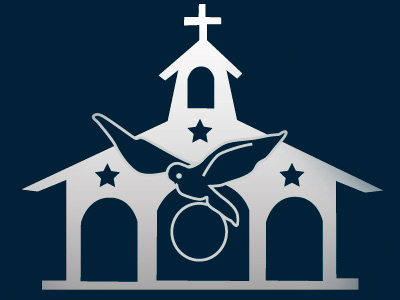 In the homily, Fr. 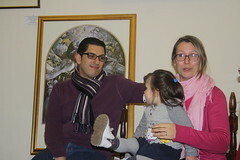 Eduardo spoke about this liturgical time of advent as a time of preparation for the coming of Our Lord Jesus Christ. 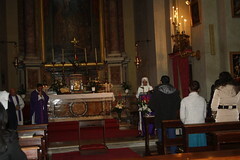 After Mass, the priest exposed the Blessed Sacrament to spend a holy hour with the Lord. There was time for prayer and points of meditation about the love that God has for us. During the hour, Father was in the confessional for those who wanted to go to confession. Once we finished the holy hour, we went up to the dining room to share the food that everyone brought. We enjoyed this time during which we could talk with each other, nourishing our body after having nourished our soul. After lunch we had a meeting about the first chapter of the Apostolic Exhortation of Pope Francis: "Evangelii Gaudium", about the announcement of the Gospel in today's world and the joy of the Gospel that fills the heart of all those who find themselves with Jesus Christ. To finish our retreat, we prayed the rosary together before a statue of the Blessed Virgin, with songs included and much joy in our hearts. Afterwards, everyone said good-bye to return to their houses. We ask Our Lady to help us live this advent close to the Lord so that, when the Child Jesus comes at Christmas, we may be able to receive Him with a heart full of joy.